It’s the time of year for planting strawberries, and we’ve decided to try it out inside the glasshouse. To avoid the disappointment of picking a juicy strawberry, only to find it tunnelled into by a slug or songololo, we’ve built straw bale pyramids for our strawberries. 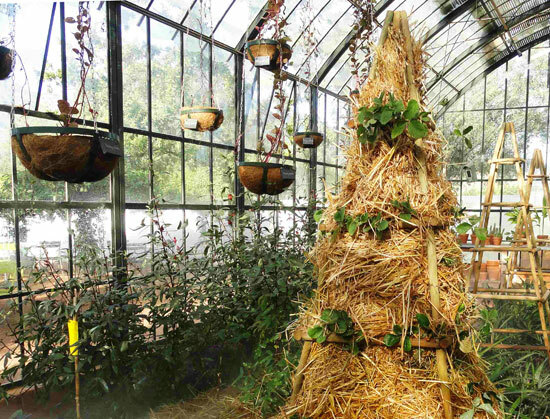 Straw has traditionally been used to cover and protect young plants from snow and frost in colder climates, and to keep fruit from rotting on the ground. Growing strawberries hydroponically is becoming popular again because it keeps the fruit from from the goggas on the ground. Hydroponics often relies on chemical feed, but we prefer to do things organically, which is why we have soaked the straw with EM (Effective Micro-organisms) to prevent fungus and release the nutrients to the plants. 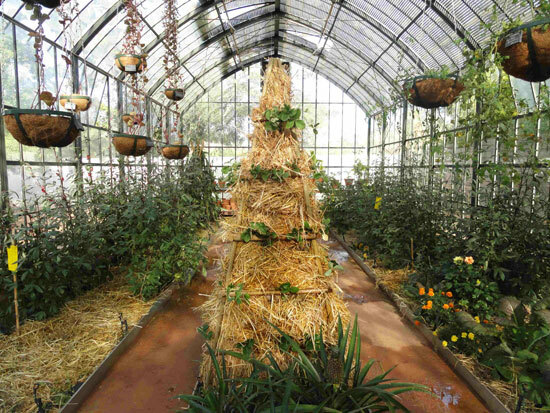 Our straw pyramids act as a holding medium through which the organic fertiliser is watered. We have also tucked soil within the bales and included a fair amount of our earthworm compost to feed the plants. We’ll also use a kelp-based foliar feed once a week, and hope that all of this will result in masses of dingly-dangly fruit in a few months’ time. In recent years, a neighbouring farm has grown strawberries in hanging baskets to prevent slug damage, and we’ll also be potting up some hanging baskets with strawberries shortly. For those of you living in small city places, this is something to consider for your balcony or stoep.